Projects at my own house have fizzled a bit. I’ve painted every room and most everything is up to date and more than livable. Only a few things are left in our master bedroom (always last, right?). Perfect timing for a few projects to pop up elsewhere. As in, other people’s homes. 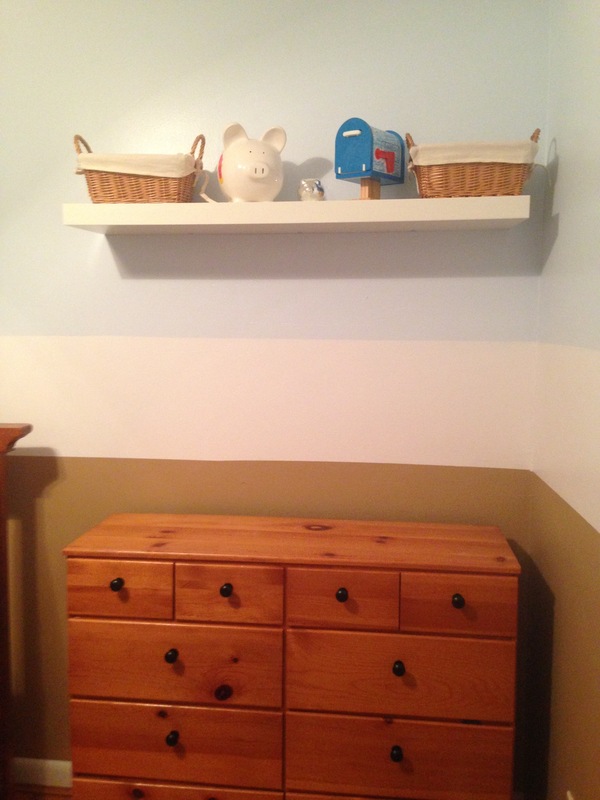 I was asked by my sister Susie to help her organize and decorate three children’s bedrooms for a friend. Admittedly, I was a little intimidated about being creative in someone else’s space but I agreed to meet with my sister and Heather. Heather is a busy mom of three who just wanted a little order to her kids’ rooms and a little cohesive decor to make them feel like they each had their own space. She told me how much she loved everything she saw on Pinterest but that she had no idea how to bring that into her own home. Not too much to ask, right? I walked through the rooms with Heather and we talked about each child, their needs for the space, what she did and didn’t like about each room and so on. Heather told us that she wanted to see more of the wood floors that she loves so much and that she liked themes if they were subtle and easy to transition away from in the future. She was gracious enough to even let me photograph each room and post about the projects. Here is a series of “before” shots with a little explanation about Heather’s needs, her kids’ wants and our ideas. Organizing is Susie’s area of expertise. She was going to do a great deal of the clean out and organizing for each room. My plan was to give each room identity with new paint, some storage furniture and curtains. So Heather and the family headed out on a week long vacation and Susie and I got to work. We did the bulk of three rooms in that week. First we prepped all of the rooms for paint, then we removed every set of built-in formica shelves from each room… they numbered into the twenties so that took us an entire evening. Before leaving we patched all the walls and sanded them down. The next few days Susie and I met at the house each evening after work. I painted like crazy, she used the master bedroom to organize each kid’s things and helped prep each room for the next phase of paint by helping me move furniture, patching/sanding and wiping down baseboards. Then I slept like a rock and returned each day to work my arse off. First up: Sam- Preschooler who loves, cars, trucks, pirates and books. He has plenty of toys that reflect this. Some of them needed homes, lots of them already had homes. 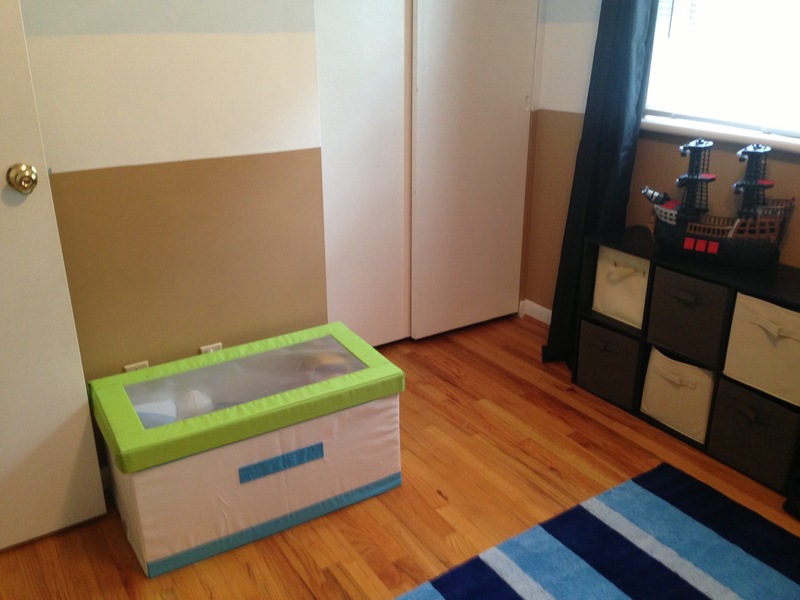 He also is in the age group of kids who are in the toddler bed but will soon need a big kid bed. His decor would need to reflect his love of these things but be flexible enough to transition into a bigger kid room down the road. Themed but not too theme-y. His room had built in shelves. They were once a thoughtful addition by the previous owner of the home but they had seen better days. Heather didn’t like their look and felt that her kids didn’t use the storage space to the fullest potential. Susie and I agreed that their position limited the furniture layout options for the room as well. Sam also had this charming solid wood dresser. It would most definitely be staying in the room. Sam’s room still mostly looked like a nursery. 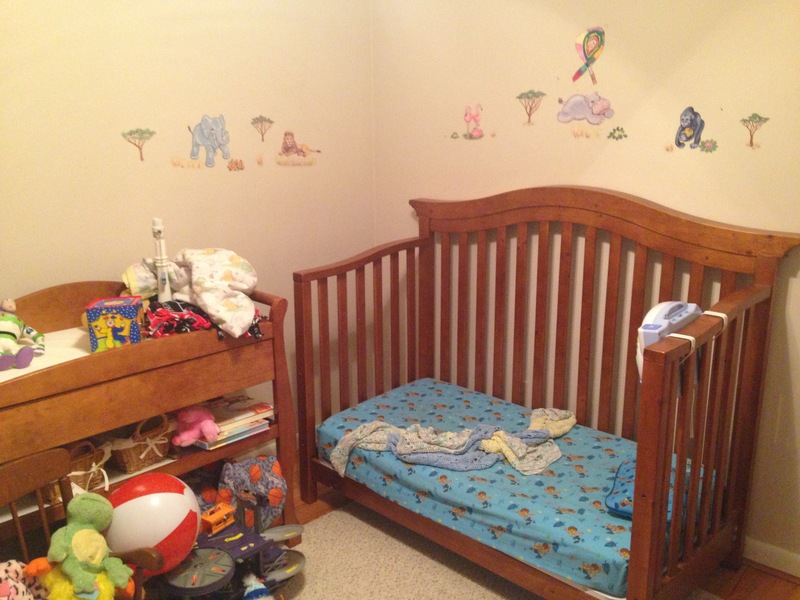 He had painted safari animal decals on the walls and a changing table still lingered in the room. He was using it for storage but it wasn’t doing much more than keeping things off the floor. 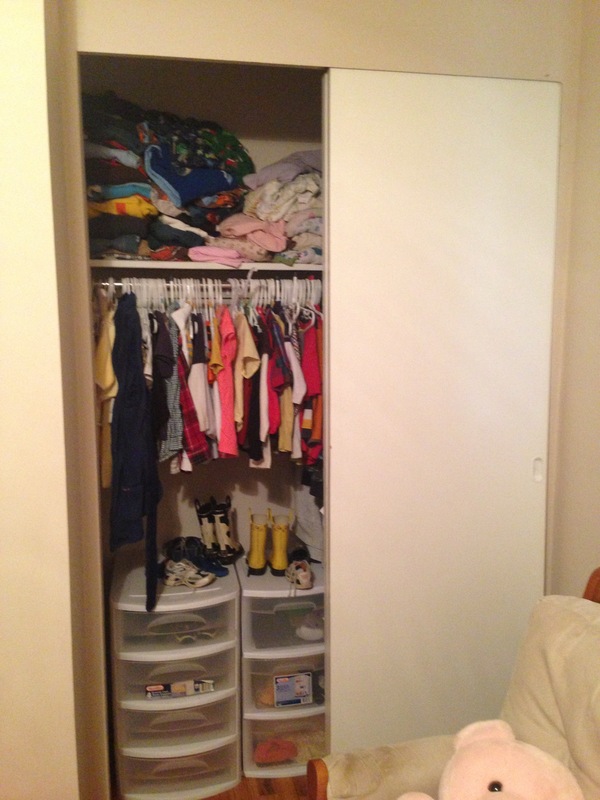 Sam’s closet was organized, Heather had just cleaned it out and added the drawers so the floor space could serve more purpose. Not pictured: Sam’s red velour curtain on a flimsy brass rod that Heather admits has been there since they moved in 9 years ago. 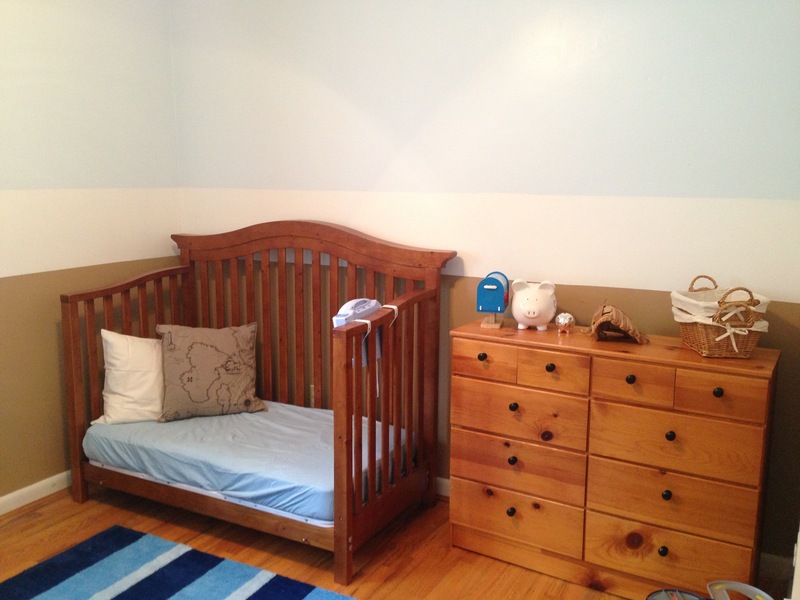 I envisioned a boy room with a soft blue on the top half of the wall and brown on the bottom. Easy color scheme to grow into but it would also lend itself nicely to a pirate themed room. I also threw in a thick cream colored stripe in the middle. 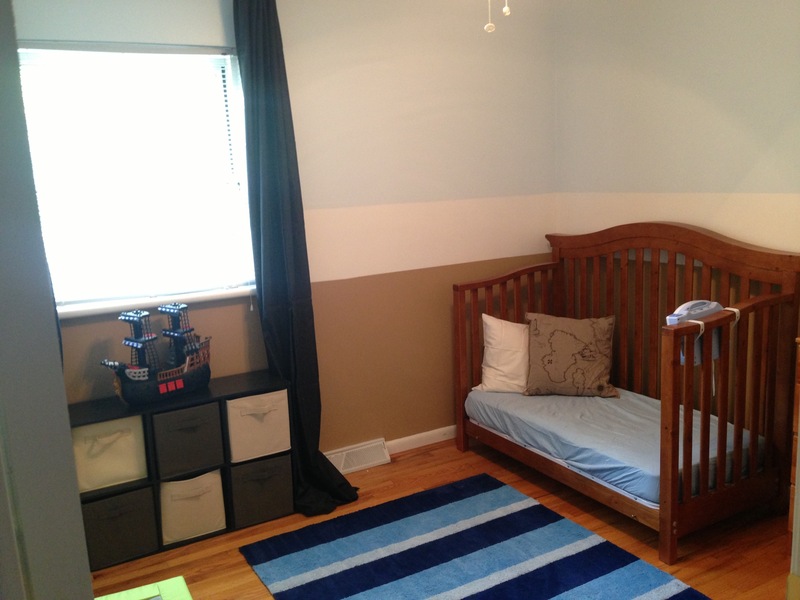 I hoped the stripe and soft color scheme could help his room feel a little taller. Here is what Sam saw when he returned from vacation. We decided to recycle Jack’s striped rug into Sam’s room to play up the super soft blue painted on the top half of the wall. We grabbed a blue crib sheet, treasure map pillow and black drawer pulls at Ikea. 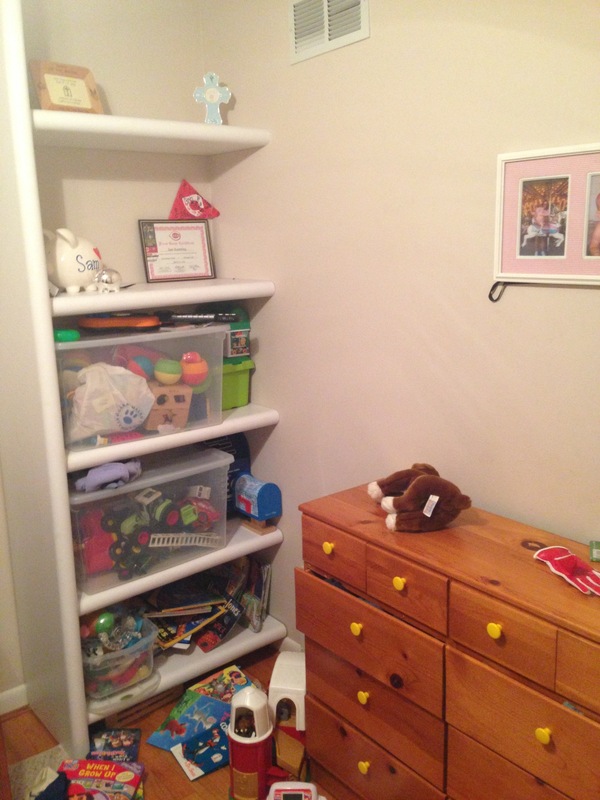 We also bought Closetmaid cubby organizers with tan and brown canvas baskets at Target for Sam’s toys. He already had that awesome pirate ship. 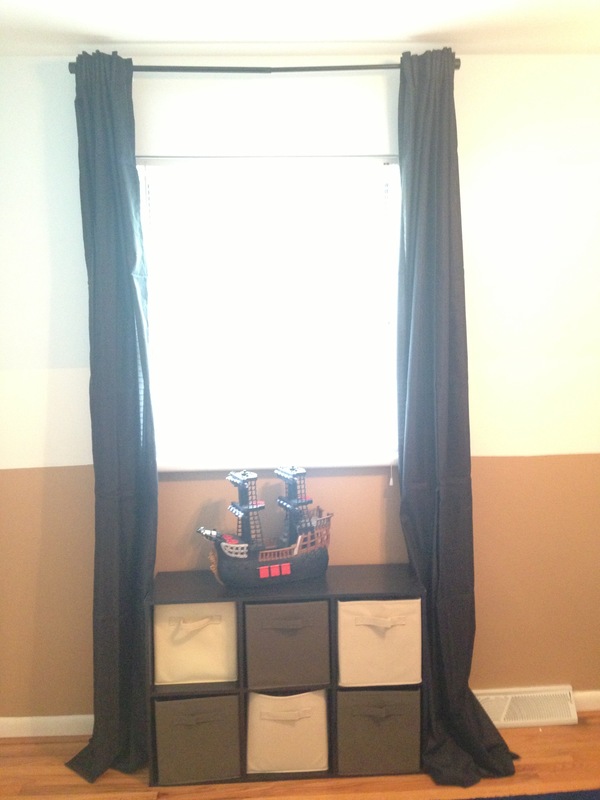 Susie convinced me that black curtains were exactly what this pirate themed room needed. A bold choice but I love the effect it gives. We hung the curtain rod just a few inches from the ceiling and about 6 inches from the outside edge of the window frame. It gives the window more room to give light and makes things feel a little more spacious. This is especially helpful since we chose such dark curtains. Rod, finials and curtains are all from Ikea. Sam had a few large toys like dump trucks and a toy barn that sat on the floor before. Susie I have no problem using floor space to store toys but we knew we could give the big guys a better place to belong. This is the closest we could find to a treasure chest. Also from Ikea, this fabric container is soft sided (no boo-boos!) corralled everything out of sight but into one place that Sam can easily access. We will be making a return visit to Sam’s room to hang a little art and a display shelf. We added an Ikea LACK shelf to Sam’s room as planned. I sooo wish you were near-by when we move into our new place! Great job! Send me pics or facetime me!